The Federal Aviation Administration grounded the Dreamliner tonight, pending an investigation into the batteries that power the plane and have so far shown a propensity for erupting in flames. This comes after days of quotes by aviation experts saying that the Dreamliner is "safe". Just how calamitous a failure does an airplane have to experience before it becomes self-evident that something's wrong? That's not an easy question to answer but I invite anyone with a good argument to challenge me on this; When fire erupts, not once but twice in the electrical heart of an airplane and the source of the flames is unknown, you have a safety problem. In today's newspapers, operators of the now suspect Dreamliner used different terms to characterize their faith in the airplane. Qantas is "confident." Bjorn Kjos, of Norwegian and a soon-to-be owner of the Dreamliner calls the recent events "minor." Until tonight's grounding of US carriers (read United) Lot Polish was operating its brand new 787 on a trans Atlantic flights to Chicago as if nothing had happened in Boston or Takamatsu, Japan. Who knows if Lot will fly the 787 tomorrow. In their own conference rooms it may be an entirely different story. In fact, I'd be willing to bet the airline executives are a lot less stoic and it is not the cracked windshields that are giving them pause. Make no mistake about it, the issue that needs tough examination here is the battery. The Dreamliner is the only commercial jetliner to use lithium ion batteries. Boeing needed the powerful yet lightweight batteries for the massive energy consumption of the Dreamliner which has even fewer electro mechanical functions than some other fly-by-wire airplanes. 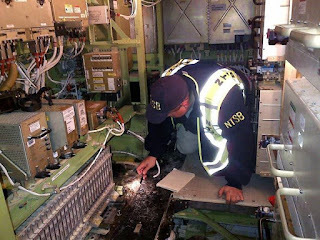 In the mid 2000s, some engineers working on the Dreamliner were concerned about potential failure modes, I've seen one particularly interesting document discussing electrical system weaknesses. This was given to me in confidence. Can smart minds working together create a safe way to get all the juice a fancy new airplane needs from a volatile energy source like lithium ion? Probably, yes. Have they? We don't know. Little weight can be given to the earlier assurances of the US Transportation Secretary that the Dreamliner is safe. In 1996, then Sect. Federico Pena made a similarly bone-headed endorsement of Valujet, an airline which suffered a crash in Miami that killed 110 people. "I have flown ValuJet. ValuJet is a safe airline," Pena said. Three weeks later, the airline was grounded for safety issues. Yep, LaHood should have known better. It's deja vu all over again. This is why I despise the unthinking, cavalier use by the media of the word "safe". It maintains the complete, indefensible fiction that a system can be "safe" or "unsafe". SAFETY is not a binary condition, like PREGNANT. You either are or are not pregnant...but you are NOT either safe or unsafe. There is a spectrum of risk and you reside somewhere on that spectrum. I have no quarrel with the FAA's issuance of an emergency AD grounding the 787's. It is the right thing to do until the problems with the Li Ion batteries can be viewed as understood. But PLEASE be clear on the fact that the FAA has responded to evidence that the risk of continued operation has risen to an unacceptable level. The airplane is not now UNSAFE, nor will it, after due engineering diligence allows amelioration of the risk associated with the batteries, be SAFE. Rather, the risk of continued operation will be reduced to acceptable levels. There is no such thing as 100% safety. If that is what you want, then I suggest that you don't get out of bed tomorrow morning. Frank you are correct but you must allow me to work in common terminology. The FAA has responded to evidence that they don't know if the airplane can operate to a level of reliability for which it was certified. When I use the word safe or unsafe it is as counter point to their claims on Friday that the plane IS safe. Clearly, they and we don't know. And when that is the case, an "unsafe" condition exists or as you would say, the level of risk is not acceptable. Thank you for the correction. I must agree with Frank's reply; this is a relative thing and ABSOLUTE safety is a goal that can never happen. Yes, we need to know a LOT more about those Lithium Ion batteries, but let's make sure that we don't judge them by the damage (apparently) done by a fire fighter's axe. Understanding this (these) electrical problem may take a while and an interim fix may be warranted. I have faith in both Boeing, the current and future U.S. operators of the 787 and certainly the NTSB, to figure it out - and fix anything that needs to be fixed. Boeing and the 787 are NOT going to vanish into the sunset. "Safety is no accident".....we can now debate what an accident is, but a close call is surely a degradation of safety margin? I am not an engineer but I am a historian and an analyst. It appears the FAA is not falling into the trap of not learning from history...it took three or four crashes of the DeHavilland Comet back in the 50's before the UK came to grips with the fact the aircraft was unsafe...which was due to a design flaw about the windows...there were sumilar issues with the Lockheed Electra...an abundance of caution is merited despite the effect on profits. Yet another classic example of the truth loosely handled in the form of a sensationalised headline designed to attract maximum "hits". That's journalism, I guess. Yes, the Dreamliner does have issues, exactly the same as (almost) all other new aircraft newly released to commercial service. That doesn't make it "Unsafe". Smoke is a major concern in ANY airborne aircraft and there are well documented incidents and (rare) tragic accidents of smoke and fire in "Safe" aircraft that have occured since man first took to the skies. There are also established procedures in place that aircrew follow resulting in an immediate landing if such a situation occurs. 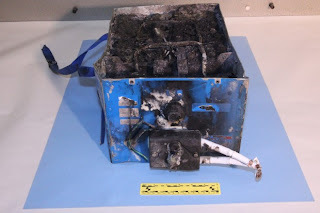 The FAA, quite rightly, has grounded the aircraft pending investigation of its cutting edge lithium-ion battery. There will be an inquiry and a "fix" will result. The Dreamliner, like so many before it, will prove to be a popular commercial success. Please keep this in perspective and stick to the facts. Nikos's misapplied the discredited "Safety is no accident" definition, which originated in the industrial safety world, and was responsible for signs that advertised "X days since the last accident," etc. More modern applications attempt to define safety margins by probability of undesired events, in which case the Li-ion battery fires on the 787 have a probability of 1. They have happened. C.O. Miller, the father of System Safety, proposed that designers should consider undesired events as binary occurrences: if they CAN happen, they will (perhaps eventually); if they CANNOT, they won't. Christine, if the FAA's concern is really whether the 787 can operate at a predetermined level of "reliability," then they don't understand the problem. As usual a wide ranging set of comments, leaning toward one side or the other whilst skipping over some of the basic fundamentals. As an Engineer I would always comment that with the best will in the world any new, highly complex product is likely to experience 'teething troubles'. A manufacturer cannot totally test everything because it would take forever, hence the 'tested to a reasonable and satisfactory level' approach with the aim of minimising the number of undesired events if I can borrow that phrase. The more professional and conscientious the Company, the less likely such events will be, but there is no guarantee of none, just that those that are, are not significant. I think the FAA got it right. As will Boeing eventually. The sketch comparing the electrical power generation of 787 and others is a JOKE! &*& is a 4-engine aircraft and every of the 4 powerplants has two alternators (one main, one auxiliary) not accounting for the APU own generator. This is completely misleading, and if you want to compare apple to apple please use B747 or A340 or A380 in the same range of aircrafts. This is a joke also since twin engine commercial aircrafts also do have 2 alternators per powerplant. Need to remove this POS. &*& should read 787. Sorry. Anonymous, the 787 is a twin engine not a four engine. So Boeing has two problems (at least). 1) The proximate cause of the fires, and 2) the validation process that missed it. By extension, the FAA process that certified it needs to be taken to root cause and fixed as well. From my experience, the NTSB is good at pushing paper and fixing the blame; stakeholder independence, root cause / corrective action and actually fixing the problem(s) instead of the blame could use some real help. As far as alternatives, I'd look at Ultracaps, first. Certainly not NiCd. For my flying, I eschew Lion in favor of NiMH w/ low discharge (Rechargable/Pre-charged). Finally, given how badly Airbus missed the market, I wouldn't rule out skulduggery, either. However, per Hanlon's razor (never attribute to malice that which can be explained by stupidity), I'd prioritize that lower in the investigation. "never attribute to malice that which can be explained by stupidity" Worldwide application of that quote. Thanks for sharing.